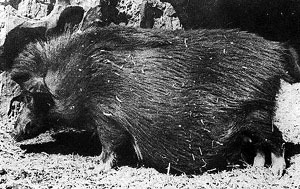 The Hezuo pig is from the Plateau region and are located in the Gannan Tibetan Autonomous Prefecture of Gansu Province, China. The altitude in this region is high (2600 m), and the temperature low . 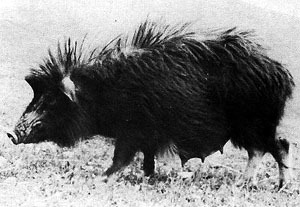 The pigs are out on pasture year round, and are characterized by long, coarse and dense bristles, a slow growth rate, and low prolifacy, with a litter size of 4 to 7; there are 5 pairs of teats. We would like to include additional information and images of this breed in our information. If you have photographs, slides or video of this breed which we could borrow please contact us using the comment form below.